Vitaly Mikhailovich Bujanovsky was a leader in the Russian school of wind playing, principal horn in the Leningrad Philharmonic, a soloist and chamber musician, composer and arranger of music for horn, and taught a generation of players, both Russian and from around the world. He taught that technique is not a goal in itself. Frøydis Ree Wekre, who studied with him in Leningrad, wrote, "Through his interpretive style one realizes that the horn has as many artistic possibilities as any of the traditional solo instruments." Bujanovsky was born in 1928 in Leningrad (now St. Petersburg) into a family of artists and musicians. His grandfather was a violinist to the Czar, and his father, Michael Nicolaevich Bujanovsky, was principal horn of the Kirov Opera Orchestra and professor at the Rimsky-Korsakov Leningrad Conservatory. Bujanovsky's first lessons were with his father, and he joined his father's section at the Kirov in 1946. Bujanovsky won the International Reicha Competition in Prague (1953) and the gold medal at the International Competition in Vienna (1959). The latter victory brought world-wide fame and respect and recognition for the Russian school of wind playing, which until then had been dismissed by critics. In 1951, Bujanovsky started teaching at the Leningrad Conservatory (now the Rimsky-Korsakov Saint Petersburg State Conservatory), where he was appointed Honored Artist (1963) and artist of the People (1978). He also taught at the Music High School and was essentially responsible for all horn instruction in Leningrad. Lessons were taught in an informal master class setting. In his instruction, Bujanovsky emphasized an understanding of the composer's intent, the national characteristics that influenced his work, and the human voice as a model for interpretation. He had an extensive collection of Russian sacred music and felt that this genre was a point of departure for understanding Russian composers before Shostakovich. Bujanovsky appeared widely as a soloist. On one memorable occasion in 1970, he played all the Mozart works for solo horn and orchestra - the four concerti, the Concert Rondo and the E major fragment - in one concert. He also recorded these and some three dozen other works. His style for the Mozart was clear and lyrical, an approach in keeping with his father's training and perhaps influenced by his mother, an opera singer. Bujanovsky's recorded many horn standards, including the Dukas Villanelle. When orchestral parts were not available for the Dukas, Bujanovsky made his own orchestration from the piano score. His orchestration skills are not surprising, given his talent as a composer. He wrote a solo sonata for Hermann Baumann, two works for Peter Damm, chamber music with prominent horn parts, and other works. He also inspired other Soviet composers to write for the horn. His España for solo horn has become a frequent work at horn symposiums since Frøydis introduced it in 1977 at the International Horn Workshop in Hartford CT.
Bujanovsky founded a woodwind quintet within the Leningrad Philharmonic. 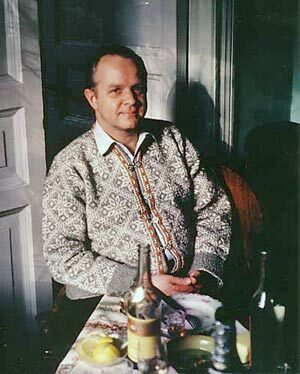 Many Soviet composers wrote for the ensemble, including Yuri Falik, whose quintet The Clowns is a staple of the repertoire. Bujanovsky was elected an IHS Honorary Member in 1985. A tribute to him appears in the November 1993 issue of The Horn Call.